Thanks for the lovely comments about my Nan! Sewing Through the Decades Challenge – the pleated waist Dirndl. After looking through the patterns, I felt I didnt need to un-factory-fold a vintage one for this – two big rectangles + waistband rectangle = skirt. Gertie has a great tutorial on making a gathered dirndl, which has photos. (Top is the Doris top from Pin Up Girl Clothing, shoes from Sandler). I really wanted one with a border print, the fabric came from the stash – but was exactly what I had planned to do with it. I added a pocket on one side copying the pattern piece off another skirt. I used a vintage ‘Lightening Brand’ metal teeth zipper and a vintage button on the waist band. The hem circumference on both skirts is about 3m. The second skirt was made using AMAZING black & red plaid taffeta. I bought the whole roll and plan on making ‘Challenge 3 – Fancy Day Dress’ out of the rest. No pockets in this number and its amazingly poofy (Fin was trying to take ‘artistic’ photos this time around). I’m going to wear it tomorrow to Royal Crown Revue. – pretty much follow Gertie’s instructions (my waistband is taller though – about 3.5cm high – and I did a lapped zipper). – I used less ease on the waist, approx half an inch, and allowed another inch for the overlap. – instead of gathering the fabric, hand pleat it to fit the waistband (it doesnt matter if the pleats arn’t 100% the same as each other, try and get them as close as possible though). It helps to mark the center front and centre back when you do this so the fabric is equally distributed. Make sure that they go in the right direction towards the zipper placket. Love the border print on the first one! So cute! OMFG, WHERE did you get the taffeta from?? It's gorgeous! This is GREAT! LOVE IT. 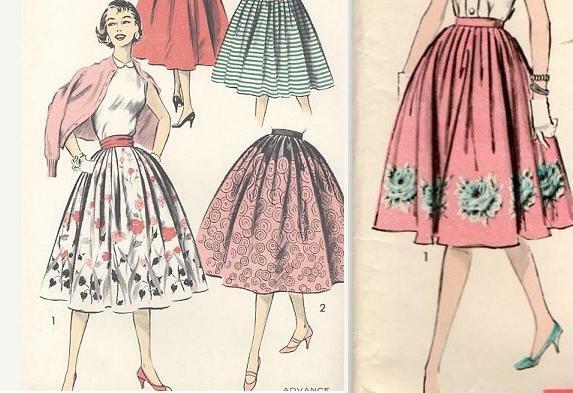 I have the pattern from Gertie bookmarked – if I can only find some taffeta. I ♥ the red and black. Seriously, great job! Hey Tia – I got it from Spotlight Liverpool would you believe! Down from $14.95 a meter to $2 a meter, its pure gold! Just found you via Sew Retro. These skirts look AWESOME. The border print fabric is perfect for this shape. And the other one is great too.